I love the sculptural quality of tulips because they make such clean, simple images … you can’t go wrong really, can you? I find this type of flower lends itself well to using a black background. Removing a petal allowed the stamen etc to be photographed from the front instead of from above. One of the challenges of photography is to present something that is a common and favourite subject for photographers in a fresh way – otherwise it can be a case of ‘if you’ve seen one, you’ve seen them all’. As with all ‘Art’ – in the end it’s all about Ideas. Could have been a little bit sharper, but I quite liked the softer look – a bit more dreamy perhaps …. My favourite subject when I used to paint was Still Life and that seems to be what I like to do best with my camera too. Sometimes I thrash around for ideas and sometimes a lone object just pops into my head and I begin to plan what the eventual picture will be. 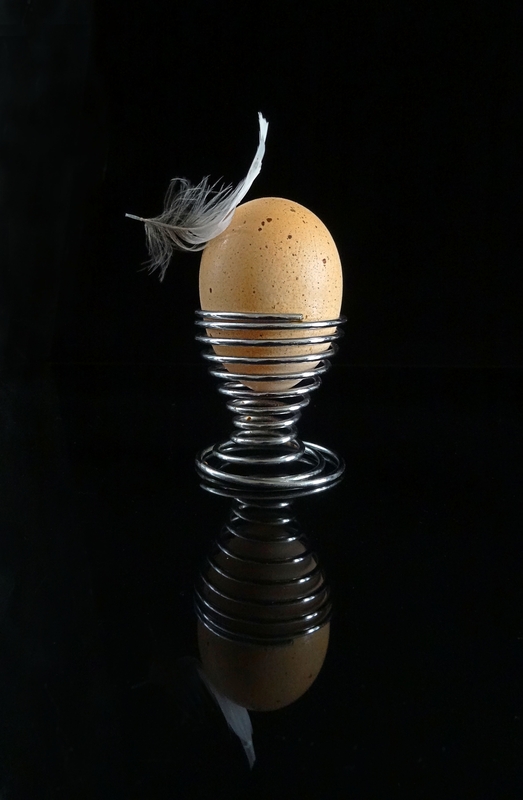 I was trying to think of something that would be more minimalistic and an Egg seemed ideal. The first image presents it in the context of food we eat for breakfast. To make it less boring, I thought I would try balancing a little white feather on top and this pic came after a couple of attempts. 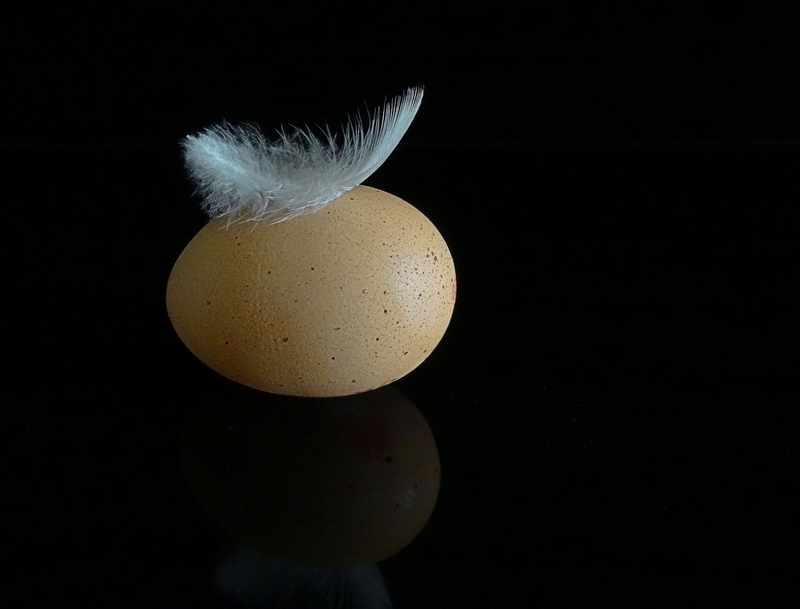 Because I’d taken it from the fridge the shell began to get a bit moist and so when I dropped the feather this time it got caught at an angle – oh goody! This is a much more minimalistic picture and more true to the idea I started out with. Hope you like it …. it’s forcing me to experiment more with lighting my subjects and I’ve learnt the hard way how highlights can glare and look ‘burnt out’, and as my room is very, very bright I’m learning to adjust my camera’s exposure settings to compensate. I’m really hankering after getting a CSC – which I may have mentioned before – they come under various names – Compact System Cameras, four-thirds cameras, mirrorless cameras et al. The thing that appeals to me is that they are lighter to hold than DSLRs and have separate lenses. It’s a bit scary for me, but I get a bit frustrated with my present cameras’ limitations [good as they have been for me] and I would love to learn to use a proper Macro lens. There are lots of bunches of tulips around in the shops at this time and I just had to buy myself a couple. They were in bud so only showing a slight hint of their colour. One lot was a bit disappointing because they appeared white with pale purple-coloured streaks but turned out completely white. The others were this lovely pinky shade. In my ‘artistic’ days when I did a lot of painting in water colour and oils, the subject I enjoyed most was Still Life. So, in the times that I’ve exhausted garden stuff to photograph, and when there are no ‘hoomans’ to hand, I turn to setting up objects indoors to get creative with. It’s essential not to have a distracting background, and in the absence of a proper studio, I bought a small Light Tent some years ago that came with a couple of spotlights and several different colour cloth backgrounds. It easily sets up on a table top, but I need to sort out my little ‘office’ so that I don’t have to keep setting up and dismantling every time I need to use it. I still have stuff to dispose of since downsizing. Anyway – back to today’s offering: I have some marbles ‘donated’ by my grandchildren which I’ve photographed a few times before. I placed some on a mirror tile and eventually managed to get them to stop rolling around …. what a palaver! As usual, if you’d like to comment just click the ‘comments’ word at the end of the opening info of this post. It was a very rainy day yesterday, so I decided to play around with some sheets of white printing paper. It was an idea I picked up from one of my many photography books. The paper is stapled at strategic points to get the required rhythmic patterns . I then used my Paintshop Pro to soften this one. This one I had fun with using a plug-in called Virtual Photogapher. The effect is called ‘blush’. Although it’s a one-click job you can also use a slider [ or in my case Paintshop] to further adjust. And lastly – this effect is called dreamy.